The bottled-in-bond trend has made its way to Tennessee. 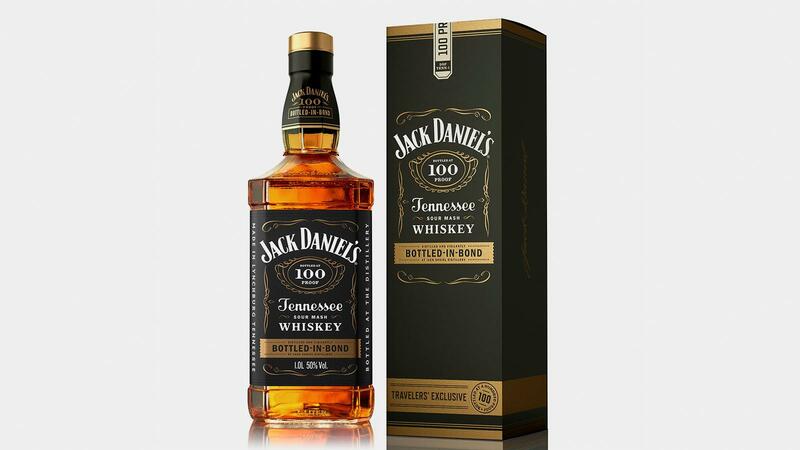 Jack Daniel’s now sells a 100-proof version of its Tennessee sour mash whiskey as a duty-free offering. The new bottling is the first of its class from the internationally famous brand and will become a permanent line extension. It is priced at $37.99 for a one-liter bottle. The resurgence of bonded spirits has been a popular, recent development, with a swarm of Bourbon, straight rye, brandy and corn whiskey brands taking the pledge to bottle under the strict regulations of a category that was created by federal regulation in 1897. As well as insisting on a 100-proof (50 percent) alcohol level, the law requires that bonded spirits be made at a single distillery in one distilling season (spring or fall) and be aged for at least four years. The new Jack Daniel’s represents a return of sorts to elevated proof. The classic black-label bottling (Old No. 7) was originally a 90-proof product. In 1987, that was lowered to 86 proof. In 2002, alcohol content was again reduced, this time to 80 proof (the minimum level for whiskeys in the United States). However, the Jack Daniel’s Single Barrel is bottled at 94 proof and special duty-free editions have been released at far higher barrel proofs. While labeled as a Tennessee sour mash whiskey, Jack Daniel’s is made similarly to straight Bourbon whisky and could be classified as such. It follows the Bourbon strictures that include a grain recipe of at least 51 percent corn and aging in new charred-oak barrels. However, Jack Daniel’s is charcoal-filtered, a step that is not taken with most Bourbons. APPEARANCE: Deep amber color. Snail’s-pace, medium-girth legs. NOSE: First whiffs are floral, moving to toffee and caramel with an ethereal quality and some dried fruit. PALATE: The 10 percent boost in proof brings a major difference in mouthfeel. The bonded Jack is markedly chewy with vanilla, caramel, toffee, some berry and a good helping of barrel notes. FINISH: The encore is long and lush with sweet herbs and a creamy quality.